Natural Language is not only the most important means of communication between human beings, it is also used over historical periods for the pres- vation of cultural achievements and their transmission from one generation to the other. During the last few decades, the ?ood of digitalized information has been growing tremendously. This tendency will continue with the globali- tion of information societies and with the growing importance of national and international computer networks. This is one reason why the theoretical und- standing and the automated treatment of communication processes based on natural language have such a decisive social and economic impact. In this c- text, the semantic representation of knowledge originally formulated in natural language plays a central part, because it connects all components of natural language processing systems, be they the automatic understanding of natural language (analysis), the rational reasoning over knowledge bases, or the g- eration of natural language expressions from formal representations. 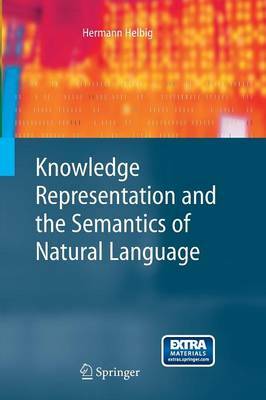 This book presents a method for the semantic representation of natural l- guage expressions (texts, sentences, phrases, etc. ) which can be used as a u- versal knowledge representation paradigm in the human sciences, like lingu- tics, cognitive psychology, or philosophy of language, as well as in com- tational linguistics and in arti?cial intelligence. It is also an attempt to close the gap between these disciplines, which to a large extent are still working separately.